Each Good Friday, the staff and residents come together in the morning to have a special service commemorating the death and resurrection of Christ. 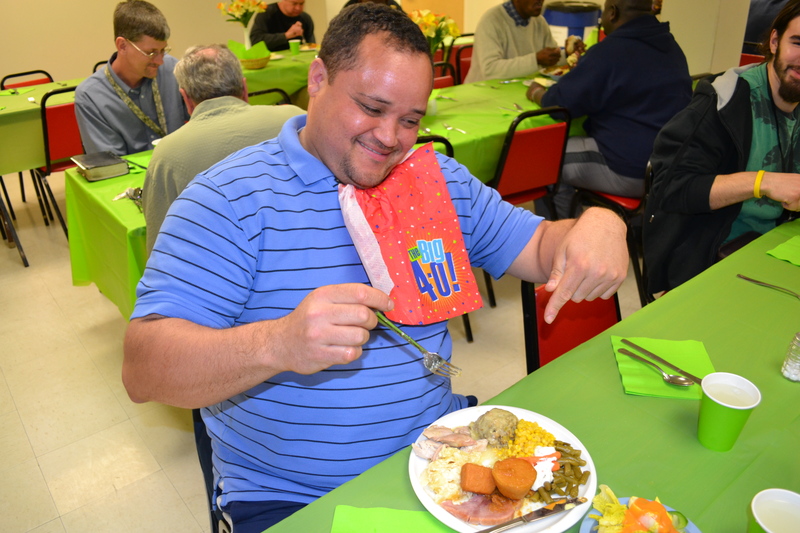 Following the service, everyone was invited to the dining commons to have a delicious lunch together. It isn’t often that the staff and residents are together in this manor so it’s nice to be able to have everyone mix and mingle and enjoy each others company. 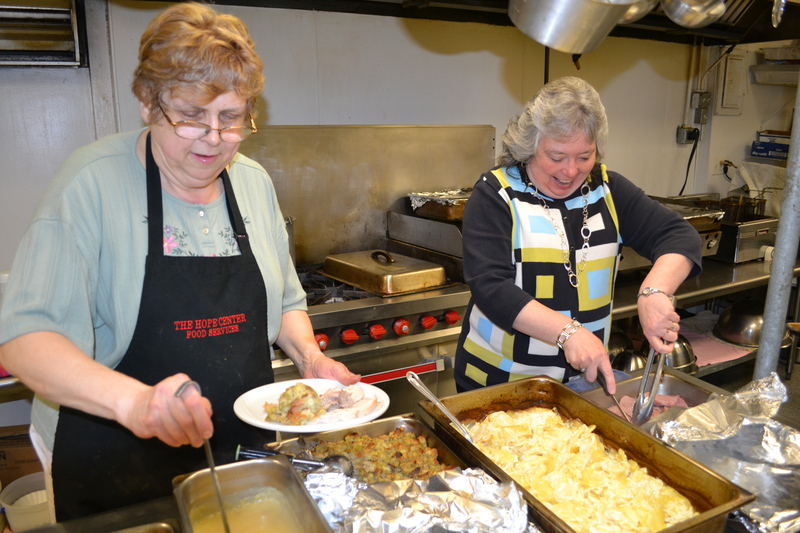 We want to thank our head cook, Aleta, for creating the wonderful lunch today! 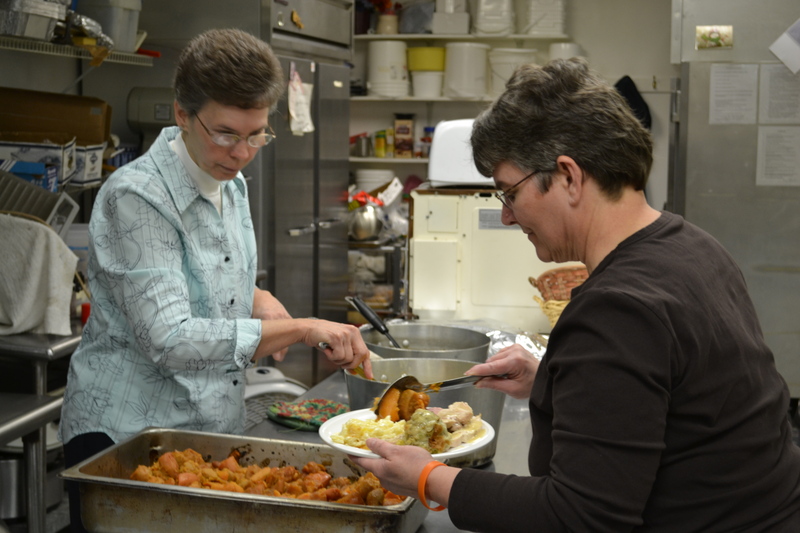 Also, thanks to Becky, Sue, Nancy, Dorcas and Sharon for helping to prepare the dining area and serve the food. Here are a few pictures of our “family” enjoying this important day together. 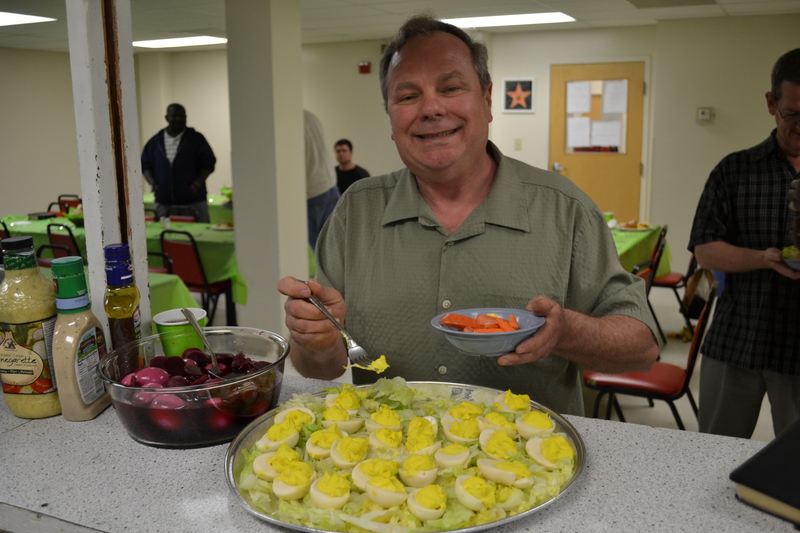 Apparently Brad is really excited to get a deviled-egg! 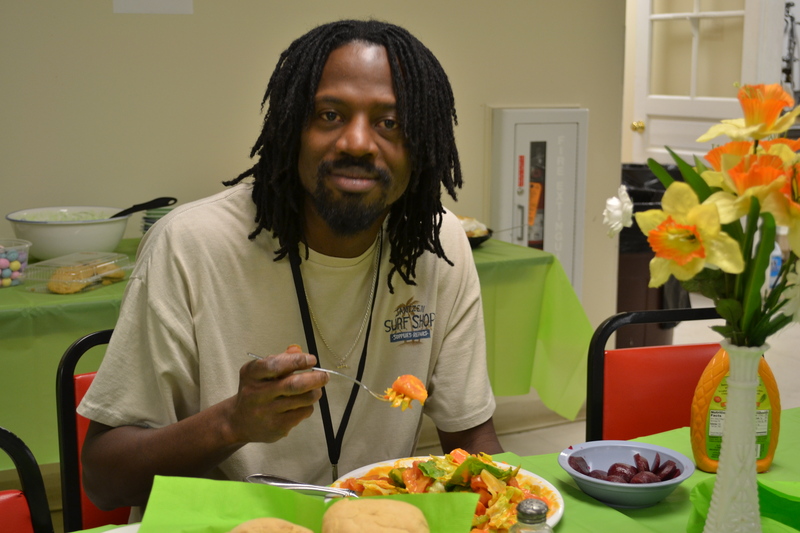 Kevin, usually working in the kitchen, is able to sit down and enjoy a big plate of greens! We hope that you and your family have a wonderful Easter together. Enjoy celebrating Christ’s victory over Satan, sin & death!! Today, Good Friday, is a day of reflection. Today we look at the incredible, painful sacrifice that Jesus endured on our behalf. We all know that His body was beaten beyond recognition. We all know that He suffered extreme physical pain, even before He was crucified. We all know that His body was so weakened that He couldn’t even continue to carry His cross down the Via Dolorosa. We know of His fear in the garden. We know of the immense pressure He was going through leading up to the moments of betrayal. We know of the betrayal of Judas. We know of the betrayal of Peter. We know how His heart hurt knowing His close friends would turn their backs on Him. But do we know the actual pain of His heart when His Father turned His back? Do we understand the incredible moment in history when God actually turned His back on a human? Imagine Jesus realizing, at that very moment, that God couldn’t look at Him. That God, in righteous justice, had to turn away. Imagine the empty feeling that Jesus felt and had to endure through those minutes. No physical pain could ever be worse. No human taunts could hurt as bad. No betrayal by His closest friends could ever cause such emptiness. Yet through it all, He persevered and endured physical, emotional and spiritual pain and death for each of us. For me! For you! It was because of us that Christ was beaten, bruised, killed and abandoned. It was our selfish sin that caused the pain. It was our inability to be reconciled on our own that caused His punishment. Today is a day of meditation. A day of thanksgiving. A day of prayer. Because of the events of today, two thousand years ago, history changed. Not just the history of man but the history of eternity. When Christ said, “it is finished”, He meant it. At that moment, all the sins of the past, all the sins of the present, and all the sins of the future were paid in full. At that moment, Christ stormed the gates of Hell. But more importantly, at that moment, God’s wrath towards me and you was fulfilled. And at that moment something new was given to mankind: hope. You and I will never have to endure the pain of separation from God, if we so choose. We have escaped the curse of humanity. We have been given a free pass to Heaven. And more importantly, we have been given an opportunity to be God’s children. Through the sacrifice, pain and torture of Jesus, we now have hope. Because God couldn’t look at Jesus on that cross, He can now look at us. When He sees me He doesn’t see me as a person riddled with sin. Sentenced to death. He sees me as redeemed. He sees what Jesus did for me. And He sees a heart that has accepted the payment of Christ. A heart filled with the hope of a promise of eternal life with God. Free from death and pain. Free of the punishment of this wicked world. Today, in the midst of your daily hustle and bustle, take time to remember the extreme price that Christ paid for you. Think about How he was totally separated from God. Think about the physical, emotional and spiritual pain that He suffered for you. And remember that today was just the beginning. Three days later Christ emerged victorious. For us. Fully resurrected by God. God no longer turned His back on His Son. Instead, He looked at Him with pride. Jesus paid the ultimate price for us. And He made it possible for us to be heirs of the Kingdom. Today we celebrate hope. The world was dark and dying without Jesus’ sacrifice. But once He said, “it is finished”, hope was born. And that same hope that was offered to me has been offered to you. It has been offered to the worst of the worst. To the repeat offender. To the most wicked. Because of Christ’s death and resurrection we have hope of eternal life. If you have never experienced the hope of Christ, what a better day than Good Friday to do so. If you believe that Jesus was truly God’s Son, sent to die for our sins and if you believe that God raised Him up therefore beating Satan, sin and death, then you need to declare to God, right now, that you believe all these things and you accept Christ’s payment for your life. That from this day forth, you are redeemed thanks to what Christ did for you on Good Friday. Make the choice today to pray, asking for forgiveness and accepting Christ’s awesome gift. There is no better way to celebrate Good Friday!